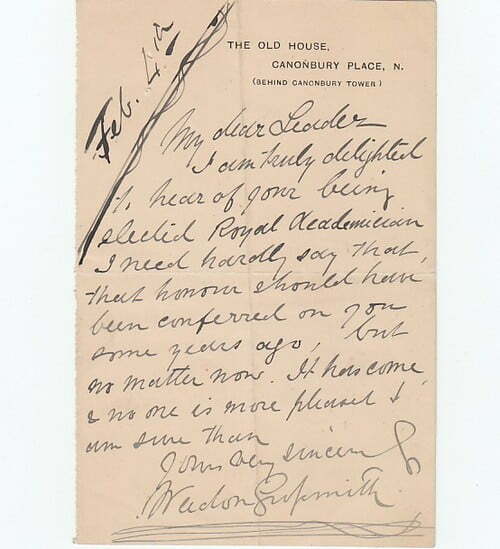 Autograph Letter Signed ‘Weedon Grossmith’, to ‘My dear Leader’, congratulating him on being elected Royal Academician. A good one page example, 6 x 4 inches, folds, 3 pinholes upper left. The Old House, Canonbury Place, 4 February, no year given. Walter Weedon Grossmith (1854-1919), writer, painter, actor and playwright, best known as co-author of Diary of a Nobody (1892) with his famous brother, music hall comedian and Gilbert and Sullivan star, George Grossmith. Weedon Grossmith also illustrated the book to much acclaim.